Govt. 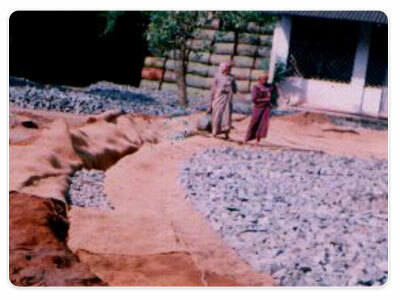 of Kerala declared the year 2000 as coir Bhoovastra Varsham to increase the multifarious application of coir geotextiles. The following experimental pilot projects were conceived and taken up on trial basis with governmental support. 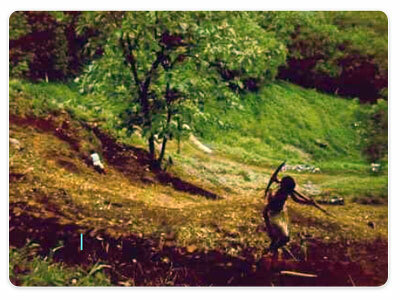 The site prone to rain shadow area in Kerala, rainfall is significantly low compared to the other parts of Kerala. 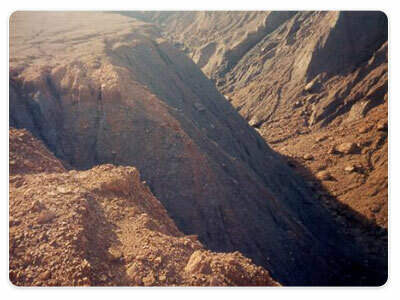 However the intensity of rain is very heavy impinging severely on earth causing huge erosion. 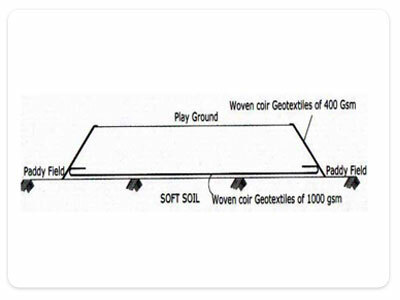 In order to augment the percolation rate of water, which in turn shall recharge the ground water table,coir geotextiles were tried as erosion control material. Vegetation has grown within 3 weeks of laying the coir geotextiles and very thick vegetation has formed within 5 weeks in the bench terracing areas. 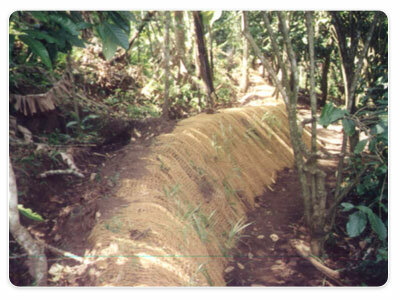 In order to protect the slopes from rainwater splash and consequent erosion, coir geotextiles were tried. Vegetation growth took place in the treated area within one month. No vegetation growth has been there on the untreated area and the subsequent monsoon has lead to gully formation in the untreated areas. Severe surface erosion takes place along the open mine waste dumps during the monsoon season and creates a lot of environmental problems in the surrounding area. 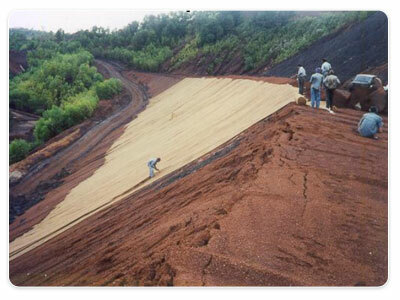 In order to prevent the surface erosion and to increase the slope stability of the dumps coir geotextiles were tried. 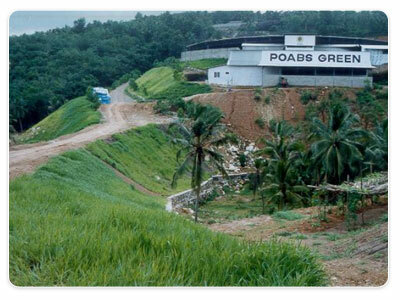 During subsequent rainy seasons and vegetation growth has also established and thereby the waste dump heaps are stabilized. 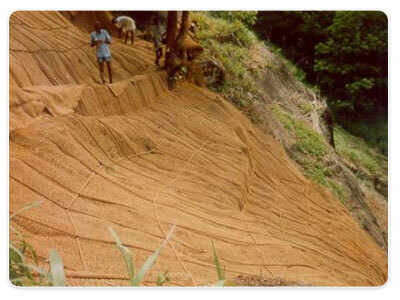 Woven coir geotextiles were used to stabilize a steep slope having 60 degrees along the Western Ghats in Kerala. The woven geotextiles was found to be effective in controlling the erosion and subsequent growth of vegetation; even on previously exposed rock surfaces along slopes having 45 degrees also it was found to be effective along 60- degrees. The Le-Meridian hotel in Cochin was constructed on a developed marshy land near one of the canals in the Cochin-Maradu region of Cochin City. The land was developed by taking proper ground improvement methods. The approach road to this five star hotel consists of two lanes separated by a median. Approach road makes a curve with an inclination and leads to the portico of the hotel. 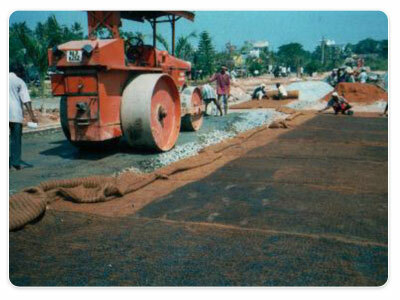 Coir geotextiles have been used in the leveled portion of the approach road. 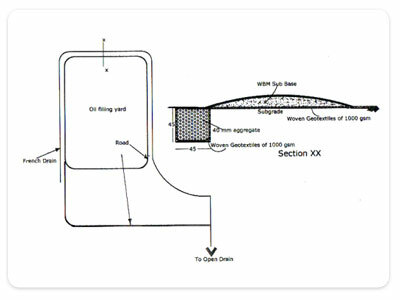 Due to the prolonged activity of oil transition, spillages of oil have changed the geotechnical properties of the soil and subsequently lead the area to a waterlogged one. To eliminate the water logging and also to prevent the penetration of aggregates in WBM into natural ground, woven coir geotextiles was used above the sub grade. 7. 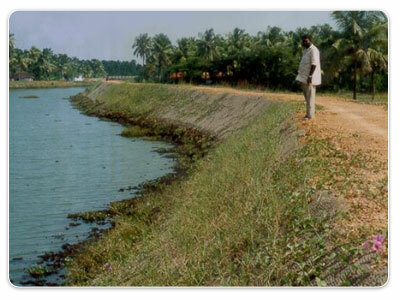 Woven Coir geotextiles for the stabilization of embankment over soft marine clays in Kuttanad, Kerala. The existing embankment will be submerged during monsoon season and thereby the side slope of the embankment as well as the surface of the unpaved road has got large undulations. 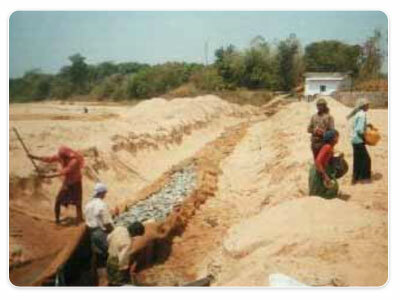 The existing embankment was raised using coir geotextiles as a reinforcement material. The Feroke Grama Panchayat of Calicut district in Kerala proposed to develop a playground in a soft soil deposit area in a paddy field. It was decided to place the embankment over a woven coir geotextile. 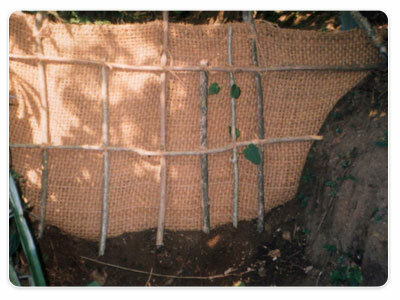 The coir geotextile used as to serve both separation and reinforcement function in this case. The side slope of the playground developed by filling has been protected by coir geotextiles as erosion control material. The vast stretch of paddy fields in Thrissur and Malappuram districts of Kerala are known as kole fields. During the rainy season, the large stretch of water bodies will create waves and subsequent soil erosion is also another perennial problem farmers are facing in these localities. We have applied the coir geotextile to raise on such existing embankment above the maximum flood level and protect the sides of the embankment from soil erosion.